There may not be a formal border crossing anymore (God bless the EU), but it’s impossible not to notice the world changing as you pass from Italy into the Germanic world (first Austria, then Germany itself). Pizzerias are rapidly replaced by metzgerei (butcher shops), portion sizes increase threefold (a very welcome change! ), and the feeble linguistic assistance provided by French and Spanish disappears completely. Two years ago, meine Oma (hereafter referred to as Erna) travelled to Germany to reconnect with the many relatives that, for many decades, were living on the other side of the Iron Curtain. Though we knew nobody in Germany personally, Erna’s stories prompted us to send her an email a few months back, asking about these German connections. 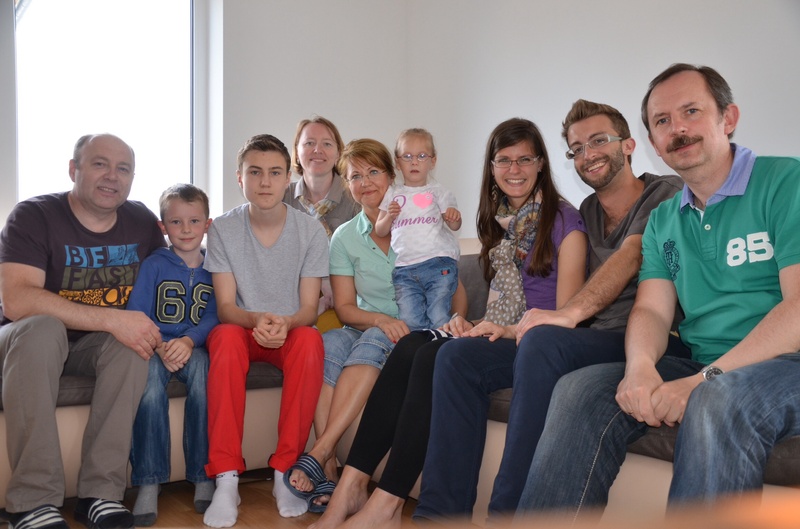 She put us in touch with her cousin’s daughter, Irina, who lives with her husband and three sons in Nuremburg, a city rich with history both medieval and modern. We exchanged a few emails and received a very generous invitation to spend a long weekend with them. The only note of apprehension was found at the end of the last email: “I don’t speak any English. I’ve been using a translation program this whole time”. With three hours left til our arrival, therefore, Sara and I cozied around the iPad on the train and frantically tried to learn as much Deutsch as we could. We got through lessons 1-8 of 85, and got really good at talking about the weather, when suddenly we were in Nuremburg. We were overcome once again by what we’ve come to call ‘blind date jitters,’ but we were comforted by our Argentine experiences. Family is family, and language barriers are nothing compared to sincere smiles and non-verbal appreciation of good food. We stepped off the train, disoriented as usual upon entering a new country, only to be immediately greeted by a very friendly couple, who turned out to be Irina and her husband Artur. They walked us to their Volkswagen van and drove us to their beautiful home in the nearby town of Burgfarrnbach, serendipitously speaking in perfectly understandable English (I guess their definition of ‘no English’ was a little less literal than our definition of ‘no Deutsch’). For the next few days, we no longer felt like backpackers, but like family. We exchanged family histories since our ancestors had parted ways in the interwar years (Artur was born in Uzbekistan, and both of them grew up speaking Russian before finally being allowed back into Germany in the early ’90s! ), ate every German delicacy imaginable (Attention mennonite family back home: they put mincemeat in their rollküchen, and it’s AWESOME! 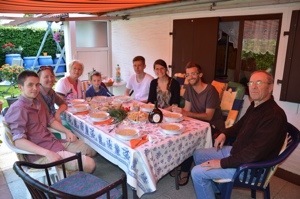 ), and met more wonderful relatives. The rest of them did not speak as much English, but between their Russian, Sara’s Ukrainian, and sampling of many local brews, we were able to communicate just fine. Family dinners cooked by Oma need no translation! 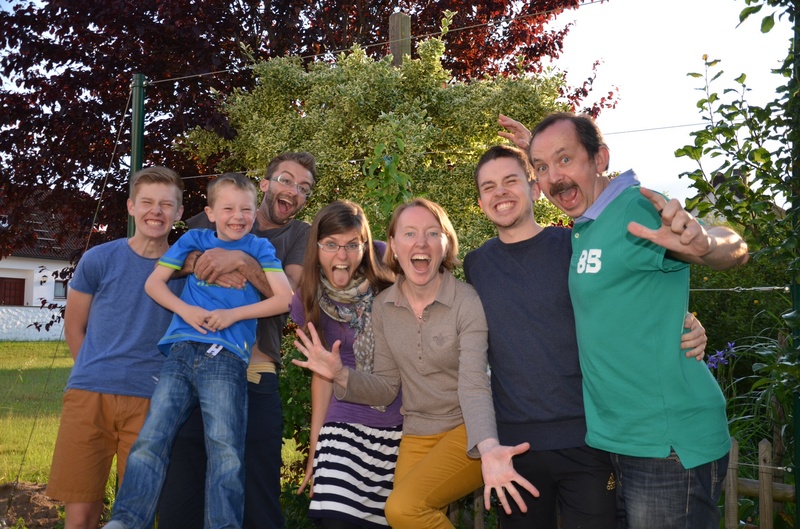 Another lovely family lunch, this time with Irina’s brother, sister-in-law, and their two kids. They also took it upon themselves to acquaint us with the historical significance of the area. Nuremburg is known worldwide as the site of the Nuremburg trials, in which Hitler’s inner circle was tried and convicted. 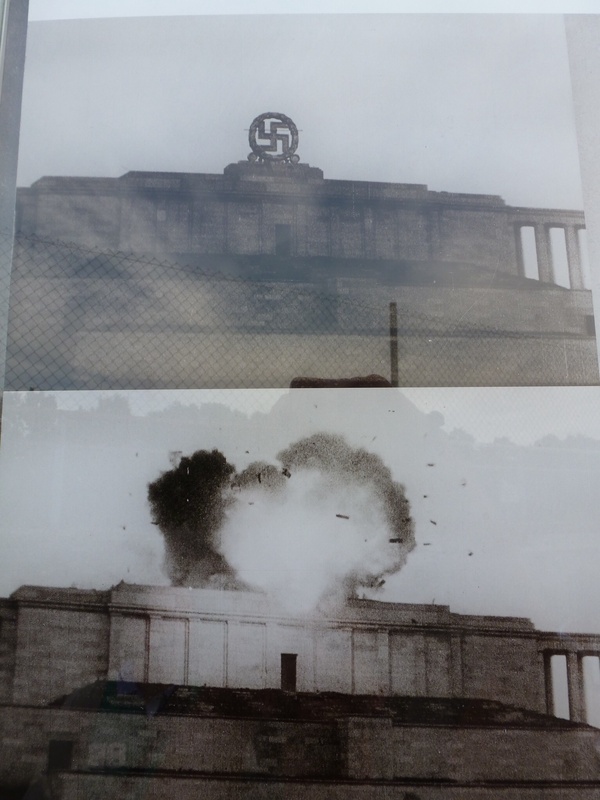 What we didn’t know was that this site was chosen because Nuremburg had been the capital of Hitler’s rise to power before the war. Holding the trials here in this city, therefore, was not only a final slap in the face to the Nazi regime, but also a form of healing for Nuremburgers seeking to move on. 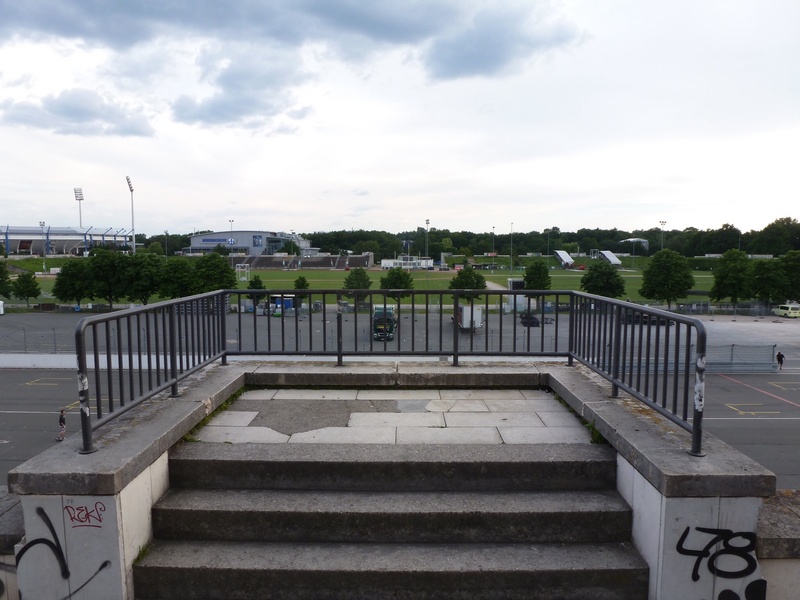 Originally a landing pad for zeppelins, this massive square became the site of Hitler’s rallies, immortalized in black & white videos of goose-stepping soldiers. Today the power of evil has been replaced with something more wholesome: skateboarders and a hockey arena. Posted at the former rally grounds, this image dramatically captures fascism’s failure. 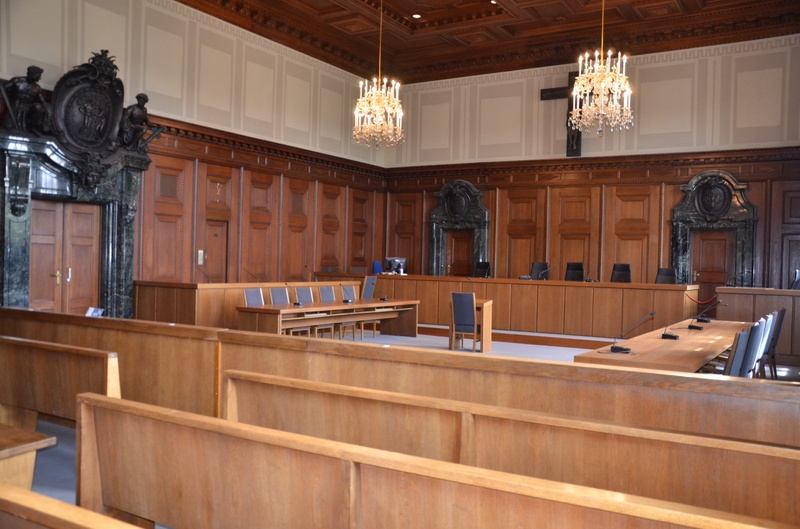 Courtroom 600, in which many Nazi leaders were tried and convicted. 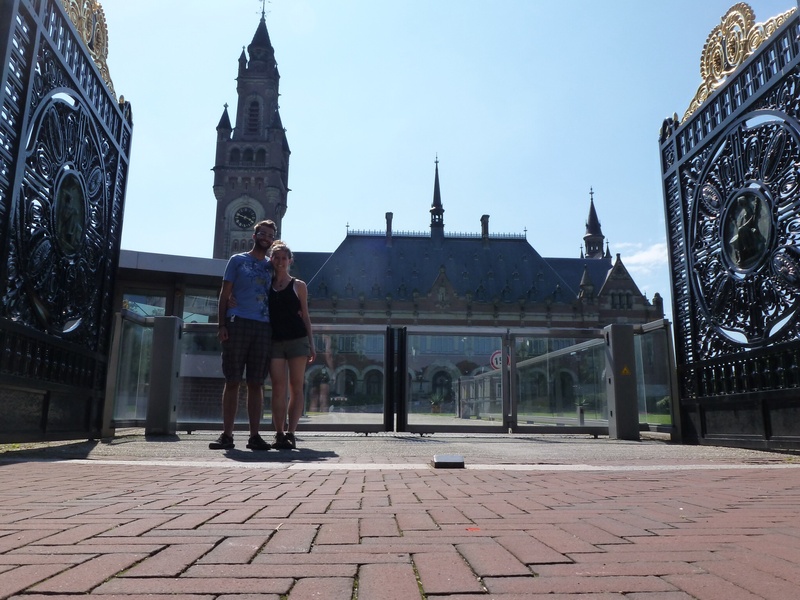 The concept of trying world leaders for crimes of global scale was born at Nuremburg, and now continues here in The Hague, Netherlands, at the International Peace Palace. Though we’ve jumped forward a few days now in our travels, this picture belongs here with the theme of ‘power paying tribute to justice’, as Chief Attorney Robert Jackson put it at the Nuremburg trials. 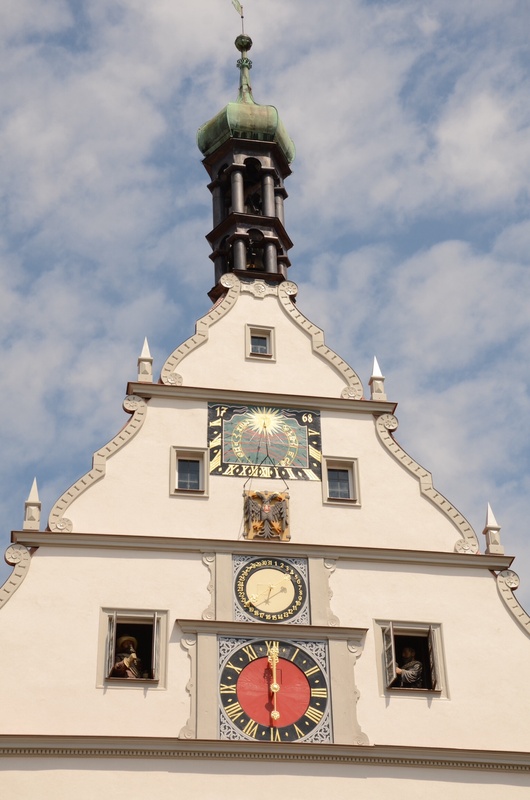 The medieval town of Rotenburg, one of our day trips with the Heinrich family, showcases a piece of their history in their central clock tower. Every day at noon, these mannequins remind us of the legendary mayor of this German town, who agreed to humiliate himself by drinking three liters of French wine in exchange for his town NOT being burned down by the French army. On a potentially related note, this region of Germany now has a booming local wine industry. Way to take one for the team, buddy. 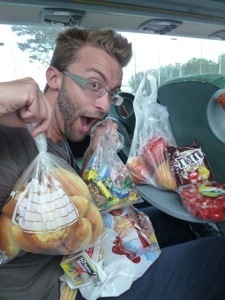 Road trip snacks packed by Irina and Oma Lillia: yes, that is a panful of homemade perogies and a tub of sour cream (and two bags of beljaschi and a massive bag of Russian chocolates and apples and tomatoes and cookies and…) These people must be family!! !